The compact disk, also known as the compact disc or quite simply the CD, was first introduced in 1982 when the digital audio CD was released into the marketplace. The acceptance was slow initially as this was a technology that was totally different than what people were used to. Individuals that enjoyed music were reluctant to try something different than their vinyl record albums or cassettes audio tapes. However, over time consumers accepted this new format as they became more familiar with it and as prices for equipment and the CDs themselves decreased. The better quality audio in some cases and the ease of use of the format (no more fast forwarding or rewinding of tape to search for a song) also led to the eventual boom of the compact disk in the marketplace. A compact disc is a digital optical format that has a diameter of 12 cm or 4.75 inches and is 1.2 mm thick. Previous to the introduction of the CD, there were other optical disk formats that were introduced in the 1970s such as the Laserdisc (also known as the Laserdisk, Laser Video Disk, and Laser Video Disc) which is larger in size than the CD and therefore it seemed appropriate to name this smaller optical disc a compact disc. The CD is part of the optical disc family because the disc is read by the light emitted from a laser. The laser light that reads compact discs is in the red region of the light spectrum (780 nm). A CD is read from the bottom, the side opposite the label side, and from the inside out in a spiral pattern. In other words it begins playing near the hub and ends on the outer portion of the disc. The picture below illustrates the concept on how a CD and other optical discs such as a DVD and Blu-ray disc play. This is opposite to the way vinyl record albums play, namely from the outside of the album inwards. A compact disc can store any type of digital information. It provides fast random access to the information. When it was introduced, its storage capacity was 650 MB. Later the 700 MB capacity CD was introduced and this disc was considered to be very high capacity, especially because it was being compared to the floppy diskette which could store only 1.44 MB. Once the popularity of the audio CD exploded, manufacturers shifted their priorities to producing a whole series of compact disc formats. There are three categories of compact disk formats. The first is read-only. 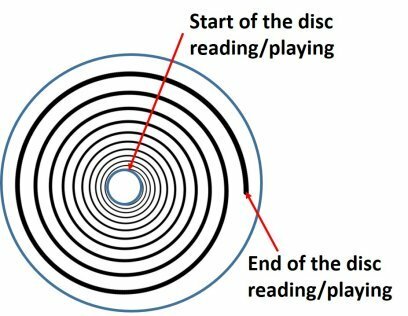 Read-only discs are purchased with the information already on the CDs and all you can do is read or play the disc. Examples are compact disc digital audio (CD-audio), cd read only memory or CD-ROMs containing software or games, CD-I (interactive CD), VCD (video CD), SACD (super audio CD), and several others. The second category is write-once. These disks are purchased blank and then you can record information to the disks. Once the recording capacity on the disc has been reached, you can no longer record more information onto them. Write once CDs are commonly known as CD-Rs or CD recordables. This format can be used for digital scrapbooking storage or storage of any other type of digital information. A nice advantage of this format is that you cannot alter the information on the disc once it has been recorded, and therefore, provides a level of security for your stored files. The third category of compact disc is erasable. These discs are purchased blank, information is recorded onto to them, the information can be erased, and the disc rewritten up to several thousand times. Once again these CD erasable discs or CD-RWs may be an option for digital scrapbook storage. In addition to discussing the above mentioned categories of compact disks, the CD section of this website provides information on the various problems that can occur with CDs such as scratching, breakage, and chemical deterioration. This information can be found at this page. Remedies for these problems are discussed where they exist so that problem media can be made playable and the information on the problem disc extracted. The longevity of the various formats is examined, as well as proper storage and handling recommendations to ensure the compact disks last as long as possible and do not degrade prematurely along with your precious digital memories. Archival CDs are also discussed in order to ensure that your digital files are stored on media that will be readable in the future. An issue with a CD collection, especially if planning to use content on a compact disk for a digital scrapbooking project is copyright. The CD copyright laws should be consulted before using the content in this way or any other way other than its intended purpose. 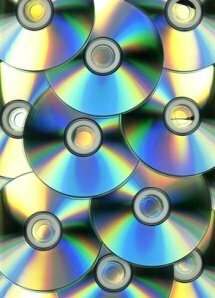 Additional information about CD capacity, longevity, and cost of the various formats, can be found at the CD DVD Storage Media page.